As The Dollar And The Euro Continue To Collapse, How High Is That Going To Push The Price Of Gold? Right now, the global financial system is facing a crisis that is really unprecedented. The reserve currency of the world (the U.S. dollar) is collapsing and the second most powerful currency on the planet (the euro) is also collapsing. As the major paper currencies of the globe crumble, the hunger that investors around the world have for gold continues to grow. Today, the price of gold hit an all-time record of $1607.90 an ounce. But that record surely will not live for long. The truth is that gold has been steadily climbing for quite some time now. A year ago, the price of gold was hovering around $1200 an ounce and and many “mainstream economists” scoffed at the idea that the price of gold could go significantly higher. Well, nobody is laughing now. As colossal debt loads continue to crush both Europe and the United States, the euro and the dollar are going to continue to collapse. There are going to be more bailouts and central banks are going to be doing more money printing. So how high is all of this going to push the price of gold? At the moment, the price of gold is experiencing its longest rally since 1980. As the financial markets become increasingly unstable, investors are looking for security, and security is not to be found in anything denominated in dollars or anything denominated in euros. The price of gold is up 13% so far this year and appears poised to go even higher. The more global financial markets get rattled, the more attractive gold is going to become. The sovereign debt crisis in Europe seemingly gets worse by the day. All of the PIIGS (Portugal, Ireland, Italy, Greece and Spain) are a complete and total financial mess. Either the EU is going to have to bail out these countries continuously or the EU is going to have to find a way to start printing a whole lot more money. Whatever happens, the reality is that the debt crisis in Europe is not going to be solved any time soon. All of this uncertainty in Europe is helping drive up the price of gold. A recent CNN article contained the following quote from portfolio manager Jim Foster…. The whole debt ceiling drama in the United States is also driving up the price of gold. Investors are getting nervous about what is going to happen. But even if a “deal” is reached, the truth is that the U.S. government still has a 14 trillion dollarnational debt and will be running trillion dollar deficits for as far as the eye can see. The U.S. has entered a seemingly endless cycle of borrowing, spending and money printing. It has become apparent to almost everyone that the U.S. dollar is a very bad investment. After all, who wants to hold on to an investment that is being devalued a little bit more every single day? Meanwhile, the U.S. economy continues to fall apart. Many believe that it is only a matter of time before we see more “stimulus” from the federal government and more “quantitative easing” from the Federal Reserve. With the world such a financial mess, it is easy to see why so many are falling in love with gold right now. But many mainstream economists are still clueless about the role of gold in the financial system. The other day during a congressional hearing, U.S. Representative Ron Paul asked Federal Reserve Chairman Ben Bernanke the following question…. Bernanke was visibly stunned for a moment before answering no. When Paul asked Bernanke why central banks still hold gold, Bernanke said that he believed that it was because of “tradition”. Video of this extraordinary exchange is posted below…. If gold is just an “asset” as Bernanke believes, then why doesn’t the Fed hold many other kinds of assets like oil, pork bellies or art collections? The truth is that gold has been money for thousands of years. Central banks all over the world continue to hold vast amounts of gold. In fact, central banks are increasing their stockpiles of gold at a staggering rate right now. 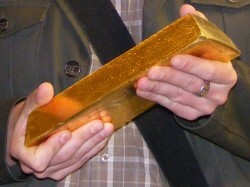 According to the World Gold Council, central banks around the globe purchased more gold during the first half of 2011 than they did all of last year. Should all of us be stocking up on gold too? Sometimes we need to stop reading the headlines and stop listening to the talking heads and just watch what the “powers that be” are doing. So how high is the price of gold going to go? A recent Forbes article had an interesting take on where the price of gold might be going…. If the price of gold should already be above $2000 an ounce, where might it be going over the longer term? Yan Chen, the head of metals and mining for Standard Chartered Equity Research, is convinced that the price of gold could hit $5,000 by the year 2020. Others believe that his forecast is far too conservative. Some financial professionals have not been afraid to forecast the the price of gold will eventually hit $10,000 an ounce. In fact, prominent names such as Peter Schiff and Porter Stansberry have mentioned $10,000 gold as a possibility. Does that mean that it is definitely going to happen? The financial world is becoming incredibly unstable. It is getting very difficult to forecast anything with certainty at this point. As the global financial system comes apart, we are going to see volatility that is going to be absolutely unprecedented. The wild swings that we have seen in recent years are nothing compared to what is coming. But one rule of economics that has stood the test of time is that gold maintains value even when everything else is falling apart. An ounce of gold would buy you a nice suit back in 1900, and an ounce of gold will buy you a nice suit today. Unfortunately, the same cannot be said of paper currencies. Your dollars and your euros are going to continually lose value. For example, the U.S. dollar has lost well over 95 percent of its value since the Federal Reserve was created back in 1913. So would you say that an asset that goes down by 95 percent is a good investment? Anyone that puts big piles of money in the bank is just going to get poorer and poorer and poorer as the U.S. dollar loses value. Federal Reserve notes have always lost value and they always will lose value. It is the way our current financial system is constructed. A huge economic storm is coming, and a small percentage of Americans will be putting a chunk of their money into gold and other precious metals while most will just be relying on the big piles of money that they have put into their bank accounts. Which group do you think will be better off in the end?